Light pruning will produce a very full product similar in body to an Itea, versus traditional shearing which produces a tall vase shaped product and typically takes an additional season to produce. Watch for Aphids and treat as necessary. This is a heavy fruiting dwarf variety of winterberry. 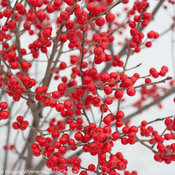 Berry Poppins is ideal for gardeners who want bright winter color and fruit for cutting but don't have room for a typical Ilex verticillata. It is heavier fruiting than 'Red Sprite'. Use Mr. Poppins asa a pollinator. Adaptable to wet soils, does well in light and heavy soils. First class pick for planting in saturated areas. Likes high moisture. Native to swampy and boggy areas. Best if pruned in late winter or early spring. No pruning really necessary unless removing dead/broken branches. Fertilize in early spring by applying a slow release fertilizer specialized for trees and shrubs. Follow the label for recommended rates of application. Use 'Jim Dandy' as pollinator.